Observe the silence rising up to sounds of night in a Jungle. You may hear a few calls of a barking deer or there could be one right above us, a hooting owl. Unlike in the day the nocturnal species create a very different feel to an experience of hiking through a forest. 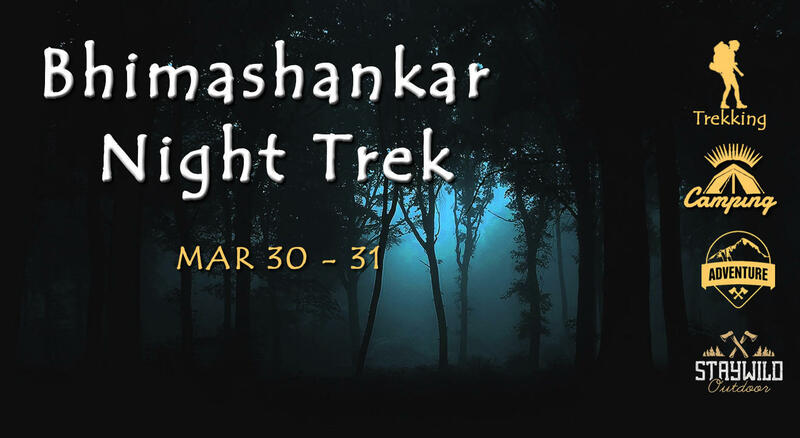 We invite you to join us on this adrenaline pumping hike that will begin from the Bhimashankar temple. The trail will pass through dense forest with a few climbs but mostly through a narrow path taken by villagers who visit the temple regularly. This trail will take us to an absolutely remote village where we will pitch our tents and end our day with stories around a bonfire. That’s what you call as a perfect Jungle exploration trip! Our private bus will do the pick-up in Pune between 3:30 – 4:00 pm. We request you to have lunch before departure. 7:30 pm - Stop for dinner at Blue Mormon Jungle Resort. This is for your convenience to use washrooms before commencing the trek. 12:30 am - Reach campsite - Bonfire, stories, stay in tents - End of day one. Hike in the forest morning time would be apt for bird calls and sightings of the malabar giant squirrel. Return by 9:00 am - Have breakfast and explore the denser forest, which stays shaded nearly 90% time of the year. Spend valuable time away from the mundane city rush. Quality time with like minded folks and humble villagers. Dinner on day 1, breakfast and lunch on day 2. Anything else not mentioned in the ‘Trip facilities’. Please wear non-bulky full body clothing like track pants, pullovers. Notify us immediately in-case of any medical emergency. We do not provide alcohol and do not encourage anyone to carry. Any one found under the influence of drugs or narcotics will be requested to leave the trip immediately, without any refund. This is an adventure trip, be prepared to leave your bedroom comforts behind. Adventure camping and outdoor sports/ recreation is purely for nature lovers and not for party groups; we respect nature and do our best to spread the awareness about wilderness preservation. Kindly observe silence post 12 am at the campsite. We like to keep the wildlife wild, please do not litter the forest and the campsite. Please confirm your registration with amount Rs. 2310/- in cash or make an online transfer.